pre-theatre dinner at BEPPE Restaurant (Italian Fare). BEPPE is a 5 minute walk from the theatre at 45 E. 22nd Street (Between Park and Broadway). Call 212-982-8422 for reservations. I am often asked "why did you write this play?" I think the best answer is: how could I not write this play? Understanding the ongoing and somewhat complicated love affair between Italy and America is the story of my life. As a child I was fascinated by both the play and the film The Rose Tattoo; Magnani's performance as well as Tennessee Williams' interest in telling a story about an Italian immigrant left me mesmerized. In college I would re-examine this film and while delving into the Williams canon, I soon learned that the play Orpheus Descending was completely different from its original incarnation (Battle of Angels) and the radical transformation of this play was due to Williams' inspired friendship with Magnani. This would culminate in her starring in the film version entitled The Fugitive Kind. While The Rose Tattoo and Orpheus Descending were written expressly for Anna Magnani, I would later discover that Sweet Bird of Youth had yet another complex lead character that was strongly influenced by Magnani. Spending much time in Rome, I began to inhale the magical vapors that burn in the ethers and thus began my journey of this play. As an artist I am fascinated by the power of the muse, and as a playwright in particular the story of Tennessee Williams and Anna Magnani spoke to me on many levels, both personally and professionally. 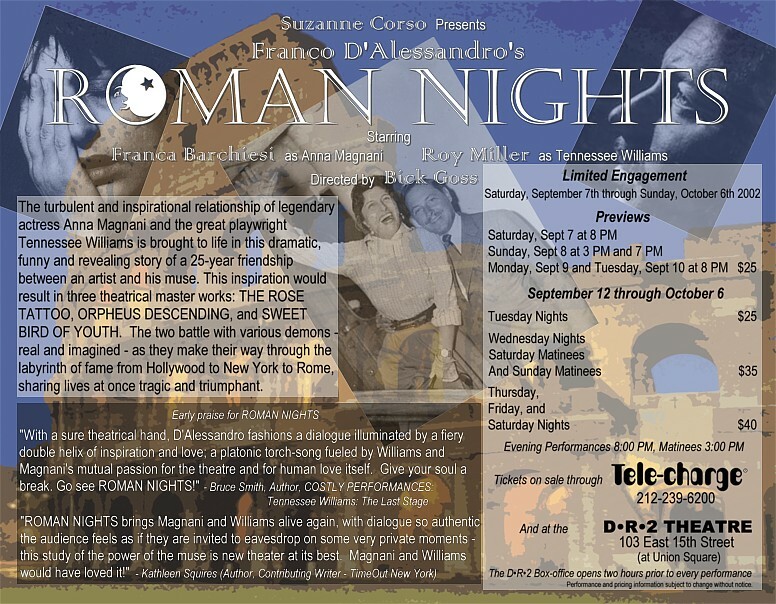 The truth is, I have uncovered as much about myself as I did Williams and Magnani in researching and writing ROMAN NIGHTS. I can only hope to shed some much-needed light on two of the most important artists of the 20th century, and hopefully spark a new generation to read the plays of Tennessee Williams and examine the films of Anna Magnani. And if, as Tennessee Williams said: 'a play should be a snare set to capture the truth of human existence,' I hope I have created something that speaks to your mind and captures your heart.